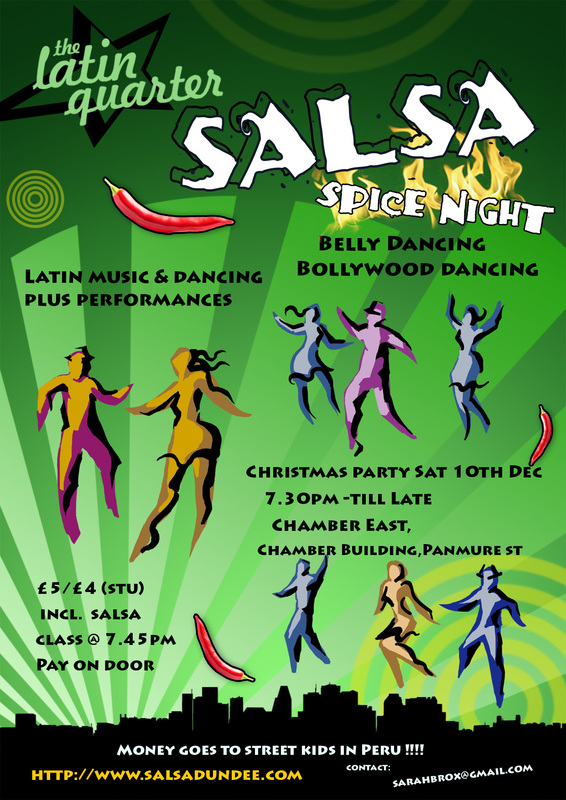 Latin Quarter Charity SPICE night / Christmas social Sat 10th Dec at The Chamber Suite ( new name Chamber East), Panmure St, Dundee DD1 1DU. Doors open at 7.30pm with a free beginners salsa class at 7.45pm, pay on the door, £5 or £4 for students. For new folks to LQ, a SPICE night is a fun Latin music social night with a twist from the Spice countries ! There are belly dancing & bollywood dance performances with an opportunity to have a go yourselves if you want ! (& a Rueda performance TBC). There’s a raffle too, all proceeds go to the Azul Wasi project for street children as usual. Please start passing the word. For more info or raffle donations please email sarahbrox@gmail.com.